In preparing to shoot a layup, the player must first work out his stride pattern toward the basket. The right-handed shooter should plant his left foot and bring his right leg up high to allow maximum extension of his right arm in releasing the ball. To do this, the next to last step with his right foot is a long step, and his last step, the takeout step, must be short to ensure a high jump rather than a broad jump. (The short takeout step also eliminates the hard bounce of the ball off the backboard that a broad jumper sometimes gets). If the player is allowed to dribble to the basket, he will develop his stride pattern more easily. He should be instructed to dribble in from a forty-five-degree angle to the basket, since doing so gives him optimum room to use the backboard in his shot. The ball is carried up with both hands from the right side of the body. (The dribbler should not swing the ball to his left during his last two steps after catching the ball. Instead, he should reach across his body with his left hand to grasp the ball.) The ball should be aimed approximately a foot above the basket. It is not necessary to put spin on the ball; the natural spin resulting from finger release will give the ball sufficient spin. There are two types of hand positions that can be employed when the ball is released. Which one is used is determined by the kind of shot taken. When traffic is heavy around the basket or when the shooter must protect the ball as he takes off toward the basket, he may elect to shoot a power layup, which is actually a jump shot taken at point-blank range (one to four feet from the basket). In a power layup, the player’s shooting hand is behind the ball and his palm faces the backboard as he jumps, usually from both feet simultaneously. 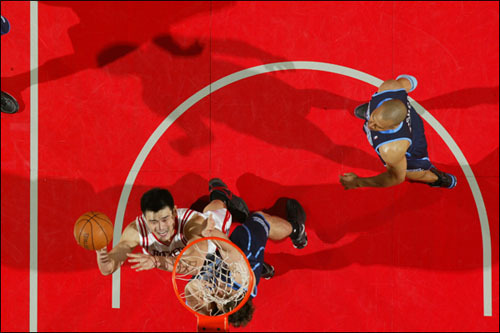 Power layups provide increased protection and control of the ball when defensive pressure is anticipated. The other kind of layup commonly encountered is the under-hand layup. The underhand layup is more of a finesse shot and leaves the shooter’s hand more quickly than the power layup. Though a power layup might be used when a player cuts backdoor around a double screen to receive a pass under the basket in a Wheel or Shuffle cut, a player probably would prefer the quicker underhand layup if he stole the ball and dribbled the length of the court for a layup. In shooting an underhand layup, the player catches the ball off his last dribble as usual but then turns the ball so that his shooting hand is directly under the ball, thus allowing the ball to roll off his fingers toward a point about a foot above the basket. His arms should be extended full length either outward or upward (preferably the latter) as he begins his jump. If the ball is released with the shooting hand beneath the ball, the shot will be placed on the backboard softly and will stand a much greater chance of going in than shots taken with a power layup grip (knuckles facing the shooter).